I can clearly recall how my fellow travel buddies showed me a photo of the best crispy squid they ever had some years back. We were staying at Dipolog’s Restreto Inn, waiting for the festivities of Hudyaka Zanorte to start. My mouth watered and I immediately asked where I can get some. Only at Iligan City’s Jacko’s Kan-Anan, came their chorus. I never thought that a year later, I would be sitting at Jacko’s Kan-Anan, facing a trayful of that same stuffed crispy squid that they showed me before. The kan-anan, or kainan (a place to eat) for the Tagalogs, hosted the first dinner of Iligan Blogger Society’s Waterfalling Adventure. Jacko’s Kan-Anan is a family-operated restaurant that has been catering sumptous dishes for the Iliganons since 2009. Their menu consists mostly of traditional Filipino fares that even your grandma would approve of. 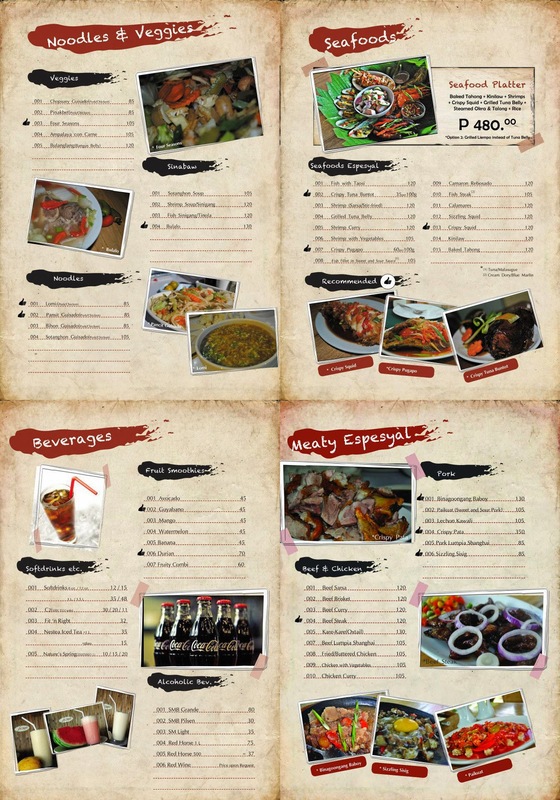 My mouth watered reading their bestsellers; crispy tuna buntot, binagoongang baboy and sizzling sisig, to name a few. The restaurant interior exudes a sense of cozy ambience with its wooden walls, floor and furniture. Warm lamps hang over the exposed rafters, giving just enough illumination for the diners without sacrificing the atmosphere of a good dining experience. The main dining area is open-aired, mimicking the traditional Filipino eateries; but an air-conditioned multi-purpose hall is also available near the resto’s garden area. Besides the coziness of the place, what really makes Jacko’s Kan-anan a hit to the people of Iligan City is their food. And with prices ranging from Php85.00 to Php120.00, they’re pretty affordable too. But it gets better. Once a month, Jacko’s offer an eat-all-you-can feast for only Php199.00. Considering how pricey an eat-all-you-can restaurant in Manila is, it’s quite a steal. We were unable to avail of their Payday Friday Eat-All-You-Can during our visit at Jacko’s, but we got the next best thing; the restaurant catered to the whole Waterfalling Adventure participants, not once, but twice! Happy tummies for us! Alright, time to stop talking. Come along now and have a look at the rest of the feast prepared just for us. And of course, one cannot eat in the southern part of the Philiipines without having puso, which is basically rice wrapped in palm leaves. Alrighty! Another serving please! Hi Kristal, are you from Iligan? I miss Jacko's dishes too!